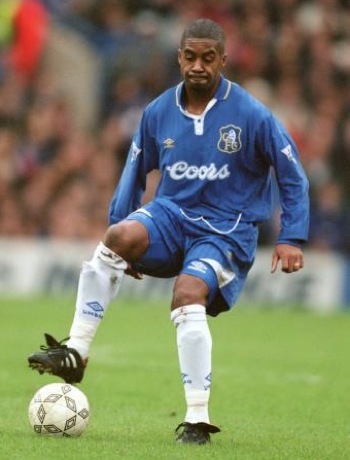 THEN In his time at Chelsea (1990-99), Newton earned a reputation as a reliable squad player, best utilised in a defensive midfield role. In many ways, he can now be viewed as the poor man’s Claude Makelele. He graduated to Chelsea’s senior squad from the club’s youth system, and enjoyed his finest hour in a blue shirt in the 1997 FA Cup final, when he scored the second goal in the 2-0 win against Middlesbrough. In truth, Newton was a strictly average player, with obvious limitations. He did nothing really well, but he did nothing really badly, which was key to his relatively long career at the top – he was a useful utility player, nothing more. When Didier Deschamps arrived at the Bridge in 1999, the writing was on the wall for Newton’s Chelsea’s career. NOW Newton converted to Islam after he retired from playing. He now coaches Chelsea at youth level, and runs his own business, New Vision Sports, which offers coaching and multisport activities for kids. He also pops up as a pundit on Sky Sports from time to time.